Milk thistle (Silybum marianum) is one of the simplest herbs to work with, and one of the safest. It’s an excellent herb for beginners to work with, and at the same time it’s one we continue to turn to in our clinical practice, even for very complex cases. The silymarin (a complex of flavonoids) in milk thistle is famous for protecting liver cells from damage. One way it does so is by aiding glutathione production – that’s one of your body’s strongest endogenous antioxidants. The liver is a site of lots of inflammatory activity as it breaks down and eliminates toxins, so it needs a solid supply of “coolant” to keep from overheating. Milk thistle helps your liver keep it cool. You know who has a tough time keeping their cool, and who likes things that are convenient? Well, pretty much everyone, it seems like – but what I had in mind was TEENS (and tweens). 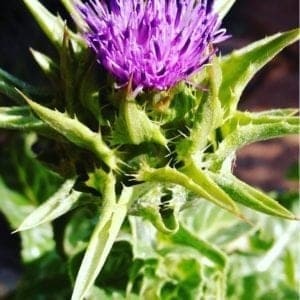 Milk thistle is a good daily herb for humans going through adolescence, and in this post, each window we look through onto milk thistle will reveal a few reason why. So read on! If you’ve got a tween or teen in your life, you might also want to check out our Supporting Kids Through Puberty course, in which Katja teaches you everything you need to know to work with herbal and holistic strategies to make puberty easier and more comfortable – for everyone in the family. In addition to its inflammation-quenching capacity, milk thistle seed also stimulates regeneration of liver cells. Your liver’s pretty good at growing back as it is – it can famously regrow itself from only 25% of its mass. (In liver transplants you don’t need the whole liver, just one lobe. Replacement tissue grows back in the donor, and in the recipient that lobe becomes an entire new liver. Wow!) Still, milk thistle kicks up that regenerative power to Wolverine-like levels. While doing so much for the hepatic system, milk thistle is also extremely gentle on the body. States of increased liver enzyme production, liver damage, and every type of liver inflammation can benefit from milk thistle seed without worry of over-stimulating, or straining the hepatic system. 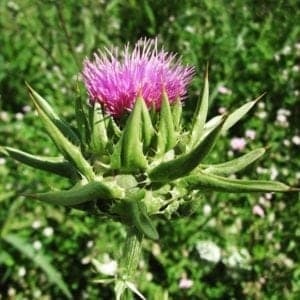 Here’s a simple way to take milk thistle: get some seeds. Run through a coffee grinder or dedicated herb grinder. Stir 1 tsp to 1 Tbsp into each meal. Milk thistle seeds have a nutty, salty, sweet flavor – you’ll hardly even know they’re there, and if they do, it’ll just add a bit of savory to your dish. Easy! And, this method is at least as potent as capsules, if not more so. That’s also a method you can use to sneak milk thistle into your family without making a big to-do about it. If you have picky eaters (say, teens or tweens), you might give that a try! And remember, we have a whole course full of clever ideas like this for you parents who are Supporting Kids Through Puberty. The liver-regenerative and antioxidant constituents of milk thistle (Silybum marianum) enter into something called the entero-hepatic loop, which means they continue to circulate through the system until every last bit of benefit they have to offer has been received. This is one of the big reasons milk thistle is so effective – you don’t lose out on some of the medicine just by having it pass right through you. It’s an important herb for the chronically stressed, under-slept, and overworked, whose high levels of adrenaline and cortisol put an increased strain on the liver. Milk thistle is also an important herb for insulin-resistant and hormonally-imbalanced bodies, as these states also add to the liver’s already large workload. This applies to people taking harsh pharmaceuticals, frequently consuming alcohol, or habitually taking other drugs as well. Let me swing back to that note about insulin resistance. That’s a problem at root of so many pathologies – heart disease, PCOS, cancer, and of course diabetes – primarily because it leads to too much sugar in the blood. Independently of its liver-centric effects, milk thistle also has some blood-sugar-lowering capacity. Here’s another methods-of-preparation note: tinctures of milk thistle can be effective. 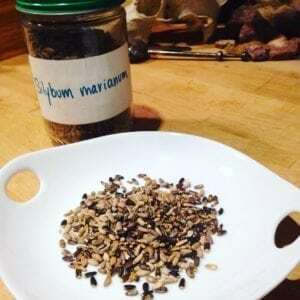 Richo Cech in his book Making Plant Medicine recommends a 1:3 herb:menstruum ratio, using the highest-proof alcohol you can get, and working with powdered seeds. He does note, though, that direct consumption is preferred whenever possible – and we agree with that assessment. Still, sometimes the convenience of a tincture is hard to beat! The only medicine that works is the one you take, so we don’t knock the suboptimal-but-effective ways. One step at a time. So far we’ve explored some of the ways the liver-protective and inflammation-cooling effects of milk thistle can help with various ailments and imbalances in the body. Let’s turn to some other qualities of milk thistle seed. With high quality fatty acids and mucilage in its seeds, this is a moistening herb. It is mildly emollient, hydrating to the skin. It’s also somewhat expectorant, directing fluid to the lungs and thereby relieving states of dryness or loosening thick, “stuck” mucous. 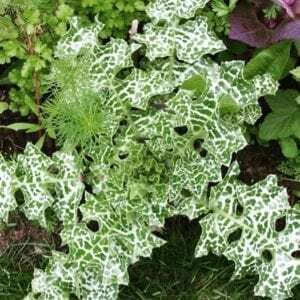 In most cases, the moistening and relaxant qualities travel together – herbs with one tend to have the other as well – and this is true of milk thistle. Its strong liver affinity means this relaxant effect is centered on the viscera, so it’s a good choice if you have cramping, constriction, or spasms in the mid-abdomen. Despite its moistening nature, you just can’t make milk thistle tea – so don’t try. Just eat, encapsulate, or tincture the powdered seeds! About identification of milk thistle: There are lots of thistles, but it’s easy to tell milk thistle apart from them – it has large, distinctive, “milky white” veins. Other thistles are good, though! Blessed thistle (Cnicus benedictus) is a good tea herb, and has many of the liver benefits of milk thistle (though not the same degree of regenerative power). Common thistles (Cirsium vulgare) are also good and bitter – remember, bitter herbs of any kind are going to wake up and activate liver function, in addition to that of the other digestive organs. Other friends to consider when working with milk thistle: burdock, dandelion root, yellow dock, st. john’s wort, calendula, yarrow – there are lots of great herbs for the liver! 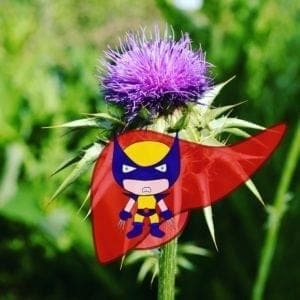 You can basically always include milk thistle capsules in someone’s general protocol if you’re focused on helping the liver. Overall, the best thing to remember about milk thistle is that it’s easy, safe, and just about foolproof. It’s great for when you’re overwhelmed or exhausted. If you’re a parent of a teen, that might be you (and them) just about every day! Consider milk thistle – and consider Katja’s course, Supporting Kids Through Puberty.